Pogo is a tiny pony—a “miniature” horse to be exact—with a very big will to live and apparently, a large destiny to fulfill. 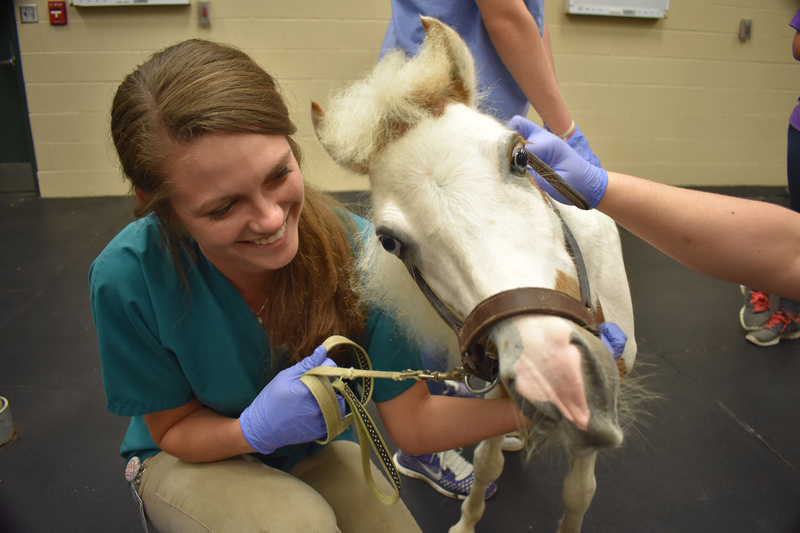 He was found by a Birmingham-based equine rescue organization this past June and brought to the Auburn University College of Veterinary Medicine for treatment following traumatic amputation of the left hind limb. Shelley Jones, of the Helping Horses of Alabama organization, rescued Pogo when he was spotted roaming free along a highway in rural Alabama. Moreover, the little pony had been surviving on its own with a severe and terrible leg wound that had left him surviving on only three hooves. Pogo and two other miniature horses, it was learned, had been attacked by a pack of dogs, according to Jones. Faculty, staff, and students at the J.T. Vaughan Large Animal Teaching Hospital play a role in Pogo’s care. Jones said they first believed the pony would have to be euthanized. “He was in such bad shape that we did not think he could survive,” she said. Pogo was evaluated by the college’s Equine Sports Medicine and Surgery Service in June for “traumatic amputation of the left hind limb from his fetlock down to his hoof,” said Dr. Lindsey Boone, an assistant clinical professor and an equine surgeon in the Department of Clinical Sciences in the College of Veterinary Medicine. out adequate soft tissue protection. In order to save Pogo, faculty recommended surgical revision of the amputated limb and preparation for application of a permanent prosthesis. Fourth-year student Rayna Gordon cares for Pogo. Boone and her surgical team in the college’s J.T Vaughan Large Animal Teaching Hospital performed the surgery to repair Pogo’s badly damaged leg. “We removed the exposed bone, created a new skin flap to protect the amputation site and allow the site to heal properly,” she said. The procedure took about an hour and it was a successful operation. Pogo was fitted with a temporary prosthetic while his wound healed and, in July, he was fitted with his permanent prosthetic leg and is doing very well. 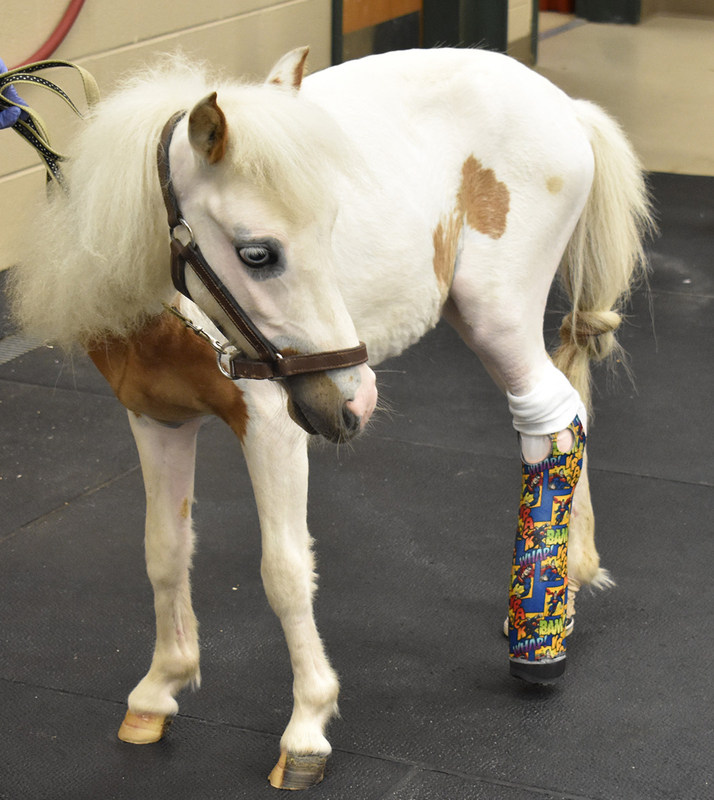 The little super pony is presently receiving rehabilitation treatment under the college’s Physical Rehabilitation Service. “Pogo was reluctant to use the prosthesis originally, but through the hard work of our Rehabilitation Service, Pogo is using the limb well,” Dr. Boone said. Jones says their plans for Pogo, once he is fully recovered and rehabilitated to his prosthetic leg, will be to use him as a therapy animal.